Hanging plants are a simple way to make use of vertical space on a porch, patio, or out in the garden. Some species are better adapted than others for this purpose, especially those that have cascading foliage. 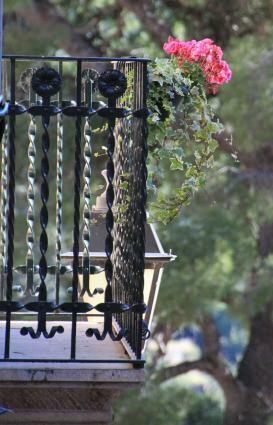 There are a few key differences between a typical potted garden and plants that are hung. The first thing to consider is the type of container that will be used. Hanging baskets are typically made of metal wire or plastic, though there are wooden varieties available, especially for mounting on a wall. Metal baskets need to be lined with either sphagnum moss or coconut coir, but often come pre-lined. These are very attractive but tend to dry out more quickly than the solid containers. If lining a basket with moss, wet the material first and then spread a half to one inch layer, making sure the entire basket is covered so that soil does not spill through. Otherwise, fill the basket to within one inch of the top with a lightweight potting mix and choose your plant materials. Place upright, non-trailing plants at the center of the basket and low growing and trailing plants around the edges. If the top of the basket will be above eye level, it is customary to only use trailing plants, as these will conceal the container as they grow - upright species won't be very visible anyway. 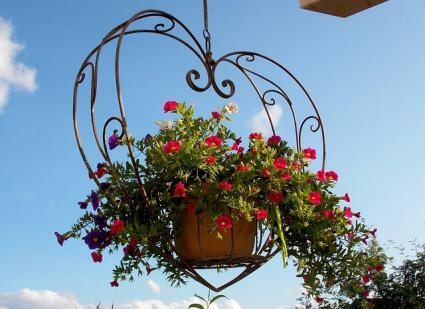 Wall-mounted planters typically come with brackets to install them, but for a hanging basket you may need to buy something to hang it from - use a simple eye screw to hang from a horizontal surface or an L-shaped bracket to attach it to a vertical surface. 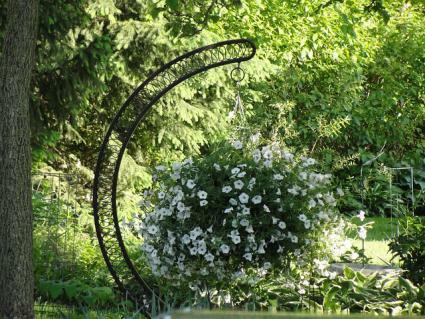 To use hanging baskets out in the open where there is nothing to mount to, most garden centers sell decorative metal poles that push easily into the ground and provide a hook to hang things on, whether a bird feeder, wind chimes or hanging plants. There may be existing objects in the landscape that they can be hung from, as well, such as the limbs of small trees. Care of hanging plants is not significantly different than for other potted plants except that they tend to dry out even faster, as they are exposed to desiccating winds on all sides. Check the soil moisture daily from spring through fall and water them until it runs out the bottom if they are even a bit dry. All that watering means nutrients are leached out quickly, so it's best to give a low dose of liquid fertilizer every two weeks or use slow release fertilizer tablets right in the soil. If the soil in a hanging basket is completely dry it will become hydrophobic, making it difficult to saturate with a hose or watering can. Instead, remove the basket and submerge it in a bucket of water until it is completely rehydrated. 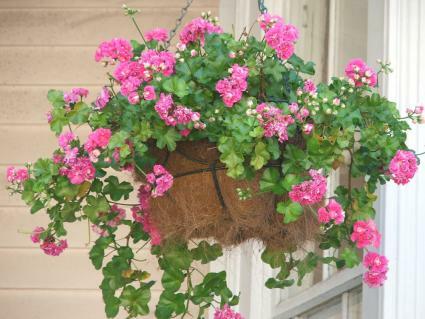 Choose your hanging basket plants according to the season and whether or not you want to include upright species or perennials. Plant these in early spring or early fall for cool weather color. Pansies don't spill more than few inches over the side of a basket, but they are unbeatable for the range of colors available. Lobelia's electric blue, pink, and white varieties are all dazzling as they spill out of a hanging basket. 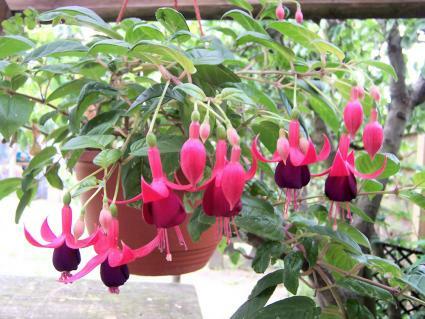 Fuchsias are classic hanging basket specimens that are technically perennials, but usually decline in the heat of summer. Plant these in early summer for season long blooms. Petunias are trailing annuals that come in dozens of colors which can be combined for a dramatic effect in hanging baskets. Sweet potato vine is a vining foliage plant that comes in chartreuse, chocolate, and burgundy tones. Bacopa is a white-flowered hanging basket staple that drapes two feet or more over the edge of a basket. Plant these in the center of a hanging basket. Sedges range in color from bright green to buff to golden orange and are grass-like plants that add a light and airy feel. Salvias are great for attracting hummingbirds and there are salvias of all sizes and colors. 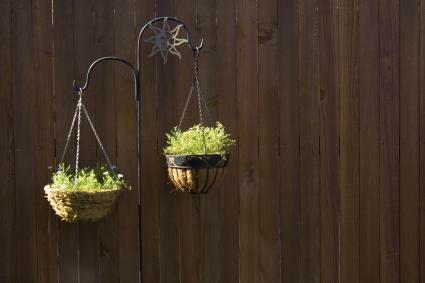 Ferns are the best choice for simple green accents when hanging baskets in shady places. Use a dwarf variety of heather as an evergreen filler. Ivy are petit, long-lived vines are bomb proof for hanging baskets in shady places and can be plain or variegated. There is no reason why plants should be confined to the ground. Think big and bold when designing a potted garden and take the simple extra step of including a few hanging plants.